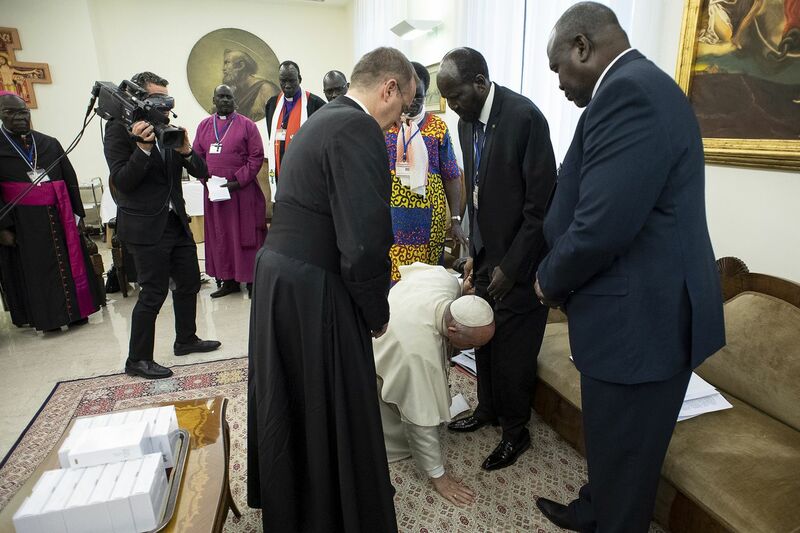 VATICAN CITY (CNS) -- At the end of a highly unusual spiritual retreat for the political leaders of warring factions, Pope Francis knelt at the feet of the leaders of South Sudan, begging them to give peace a chance and to be worthy "fathers of the nation." "Servant of the servants" - I really love Pope Francis! I wrote this yesterday after reading several items about the Benedict letter. I think it fits best here. I just do not believe that the scandalous behaviors about which Benedict writes are a manifestation of some new explosion of sexual freedom. If there is anyone who thinks that the behaviors of the current scandals are any different than such behaviors throughout the history of the Church and, for that matter, any other institutions and societies, that person lacks any sense of the human condition. Addictions, personality disorders, psychological traumas, the effects of homelife and child-rearing practices – there are numerous underlying motivations of human behaviors that have little to do with evil, the devil, or even conscious choice. There are few among us, including clergy and religious, who are not victims of the human condition. What God, the Church, and religion provide is an avenue of hope and redemption and restoration for we humans caught up in behaviors over which self-control and self-determination is possible, except for the truly mentally ill. God is love, so that source must be preached without fail or surcease. The Church must be love and the agents of it must provide the absolute sense of love to people who seek hope and redemption and restoration. That is what religion must be all about, something lacking in prescriptions and condemnations and denigrations that so often are the wrong substitutes for instruction, guidance and unending patience for all humans. Today’s reports of Pope Francis symbolically kissing the feet of South Sudanese political opponents in a gesture to emphasize the need for peace to their people demonstrates what I mean. Hurling epithets, condemnations, and excommunications is no substitute for the humility demonstrated by Francis’ witness of the need for a love that abandons one’s own ego and urges for the well-being of others. That is the Christ demonstrating the love of God, a model to the Church which so many repudiate.